Well the morning run was hard work. Lead legs, stiff and painful lower back (hence the lead legs) and just not that impressive really. It was especially hard to get out the door. But you know what? It was fantastic because I DID get out the door, and I may not have broken any records (even my own modest PB’s) for distance or speed, but I got out there and did it, so its a win. 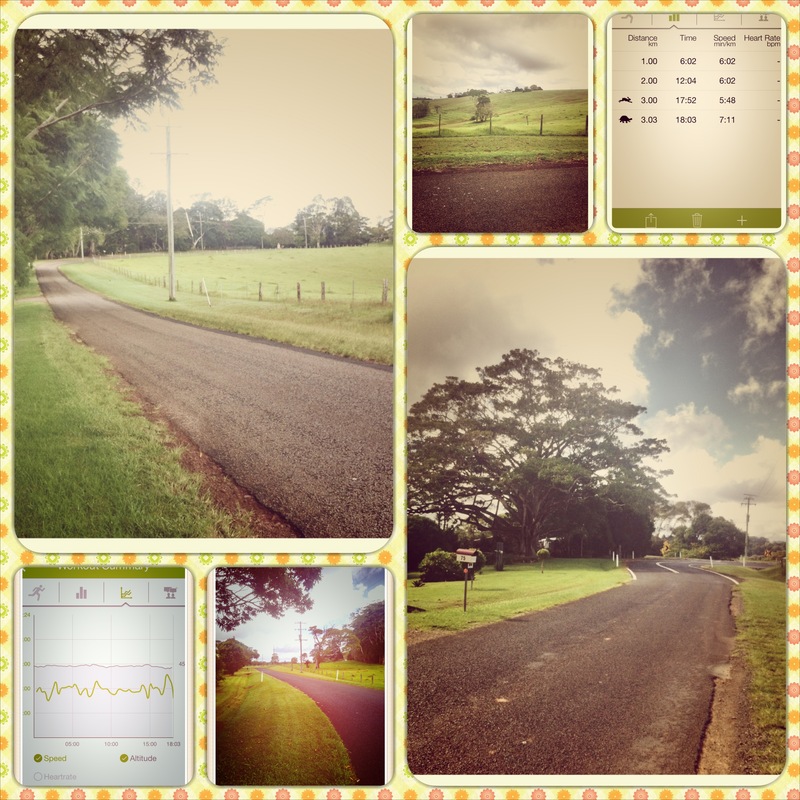 And I got to run in the beautiful Maleny countryside, another win. Some days are just like that, hard bloody work. Some days I don’t even make it to the front door, with this that and Mr 3 clinging on crying that he doesn’t want me to go out, EVER (contrary little bugger that he is, happy enough to amuse himself unless I appear to be getting on with my own work, or god forbid enjoying myself, then desperately needs my full and undivided attention). But its OK not to get out the door sometimes, its OK not to be 100% 100% of the time. Heck, its good for you to have a quiet day every now and then, power down & rest, gather to reboot. Take these opportunities when you can! we’re all so busy nowdays, multitasking, running hither and thither like chooks with our heads cut off, it can be quite daunting just to slow it down, take it in and do one thing at a time. Especially with littles demanding and needing our very souls every single minute of every single day. So sometimes we get to do our thing, sometimes not. Don’t beat yourself up if you didn’t get to train, just keep plugging away, doing it when you can. It will get better. Just don’t forget, to take some minutes, every day, just for YOU. and do what YOU like doing. Read, write, draw, paint, sing, dance, run, jump, play or just veg out, you need it, and you deserve it. Oh, and, I just have to say, that I am blessed that I get to go for a run in this beautiful place. and that I am blessed just to get out the door by myself, in the fresh air every now and again. Thank you daddy, for looking after the little while I gather myself, I needed that. super lucky to live in the countryside at Maleny.